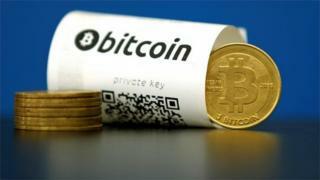 Chinese spot checks on Bitcoin trading have hit the digital currency's value. China's central bank said it wanted to investigate market manipulation, money laundering and unauthorised financing. Chinese exchanges trading in the currency have seen the price of Bitcoin fall more than 16%. The move comes as Beijing's tries to crack down on money flowing out of the country illegally. The weakening yuan has prompted many people to try to buy foreign currencies. The Bitcoin currency had soared to record highs in the first days of 2017, a rise attributed largely to strong demand from China, where most Bitcoin trading takes place. The Chinese central bank said that the "spot checks were focused on how the exchanges implement policies including forex management and anti-money laundering". The currency traded at $760 (£624) on Thursday morning, down from more than $915 the previous day. Earlier in January, Bitcoin hit a $1,129 high. The crypto-currency relies on web-based transactions handled across thousands of computers and is used as an anonymous way to move money globally. As a result, some speculate that people in China are using it to circumnavigate strict government rules aimed at preventing money from leaving the country. Currently, there's an annual maximum that people are legally allowed to change into a foreign currency. The value of the yuan fell by about 7% last year. In contrast, Bitcoin's value rose by 125% in 2016, making it the world's best-performing currency when compared with its central bank-issued peers.